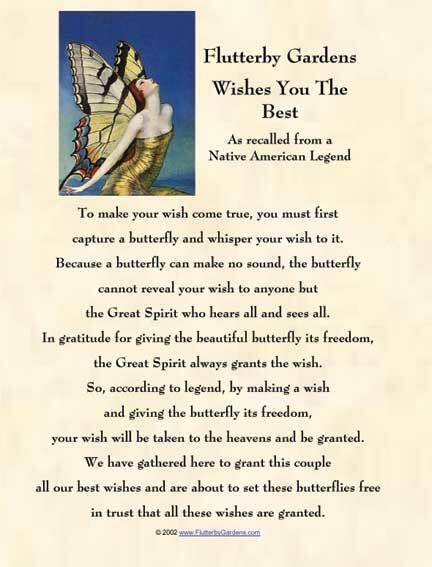 Download and print out beautiful PDF versions of the Butterfly Wedding Legend for your guests by clicking here. The Legend Certificate will print out with all content shown, including the background parchment pattern. Use white bond paper, and set your printer to the "High Quality" or "Normal" setting for print quality. Do not select the "Draft" quality setting. After printing, trim off the white border that appears on the certificates (due to printer default settings) before presenting the certificates to your guests. For a special impression, use photographic glossy paper. Or, print a reverse heat transfer image to apply this beautiful sentiment to T-shirt gifts for your guests.